Panorganizer is a full system solution concieved by Phil Holland to quickly capture and organize Spherical High Dynamic Range Images on live action movie sets. These images are used for matte paintings, look development, texture painting, set reference, and are an invaluable tool when creating image based photo realistic lighting in a visual effects post production environment. Panorganizer software and rigs have been used on productions for several years all over the world and have been deployed at several VFX studios as a permanent fixture in their lighting pipelines. In typical use the Panorganizer software lives on the HDR Operator's on set data collecting laptop. During the course of production the operator will shoot and download the images from one of the HDR Rigs on set; usually at the end of each work day. However, the system is flexible enough to allow shooting for several weeks without downloading which is useful if you are in a remote location. After the source images are downloaded, Panorganizer automates the organization of large quantities of HDR panoramic images, which typically takes a great deal of time due to the volume of the images. 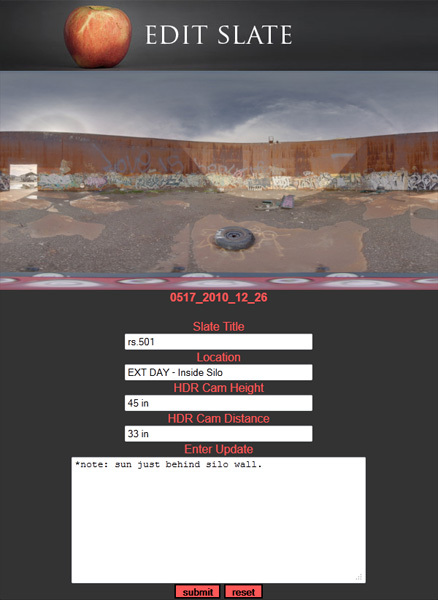 The system creates a small database complete with stitched 360 degree low resolution preview images and is visualized within simple to use web browser based interface. The operator can then go and log on set data, enter scene information, review settings, and perform quality control. The images are stored to allow easy syncing of information back with the VFX studio. Often users sync/ftp after each work day. The studio then has the HDR data to utilize while the motion picture is still in the production phase. 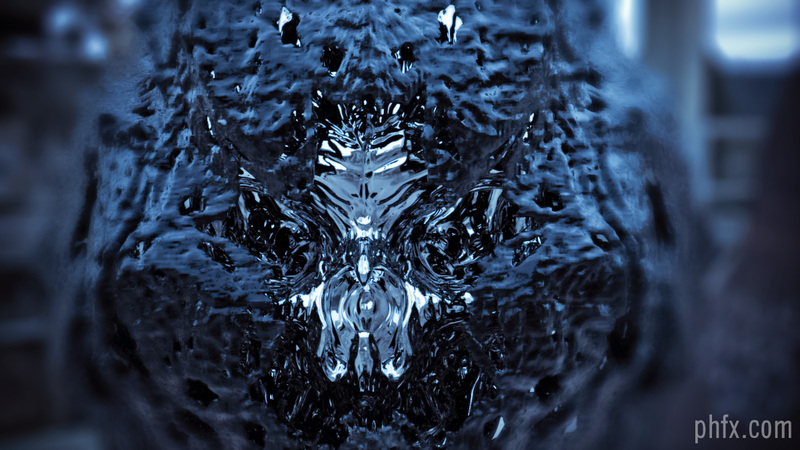 Getting the HDR images early helps speed up post production pipelines immenseley. Look development and previsualization can occur before plates have even arrived at the studio. 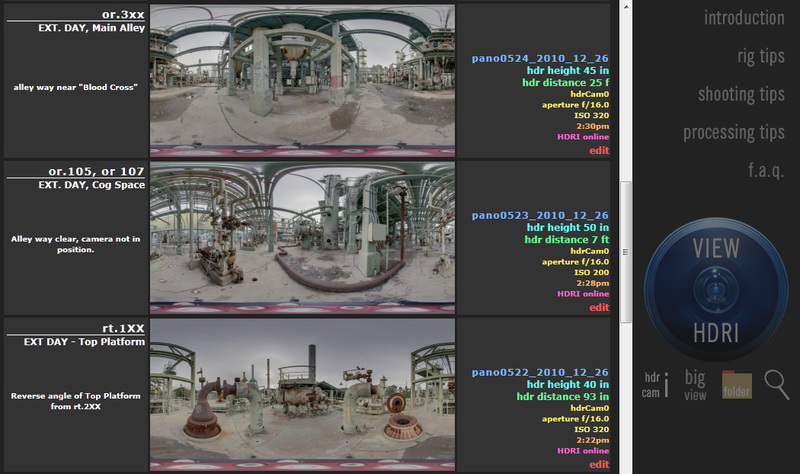 Panorganizer uses off the shelf and custom software for it's image processing ensuring flexibility, upgradability, and producing accurate HDR image processing. The typical installation for each remote Panorganizer system allows the HDR operator to not only develop preview images but also bake full resolution HDR images on set if desired. The HDR Rigs themselves are fully modular and mostly built with off the shelf components, minus a small bracket and a few cables. Typically each feature production gets two to four rigs. If there is a catostrophic issue like a camera fall, it's a fairly trivial process to swap damaged components. The standard rig is suitable for up to 8k spherical hdr panoramas and can export in any 32 bit format you desire, typically Radiance, OpenEXR, or 32Bit Tiff. Good for not only lighting, but often for environment and reflection maps as well. The rig is customizable in terms of speed. The default system captures a full resolution HDR panorama in just 19 seconds. There are options available to shoot faster but 19 seconds is a "safe" speed and produces high quality results. Since the system is flexible enough to accomodate more advanced rigs, it's possible to produce and capture much higher resolution imagery. 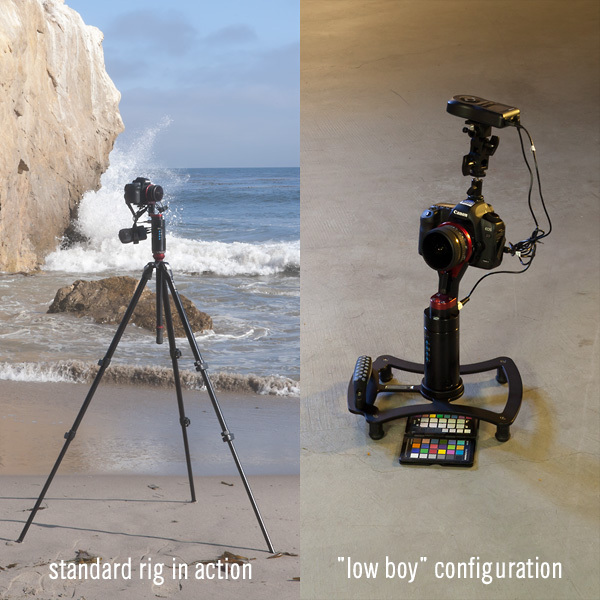 The standard rig provides an affordable solution with high quality output, a much more compact size, and faster capture speed compared to other comparable systems. Also, using a single modern DSLR as the primary capture device allows for an affordable upgrade path as camera technology improves. Most units deployed today make use of the Canon 5D Mark II for it's impressive low light capabilities. The standard rig's compact size allows for a minimal nadir footprint that is easy to handle later on if necessary. It also doubles as a source to pick white balance if desired. The rigs can be "fired" at the capture rig, via a tethered cable, or even wirelessly at 150 feet away from any stable base like a Technocrane or Genie Lift. It is simple to mount and extremely flexible in practice. 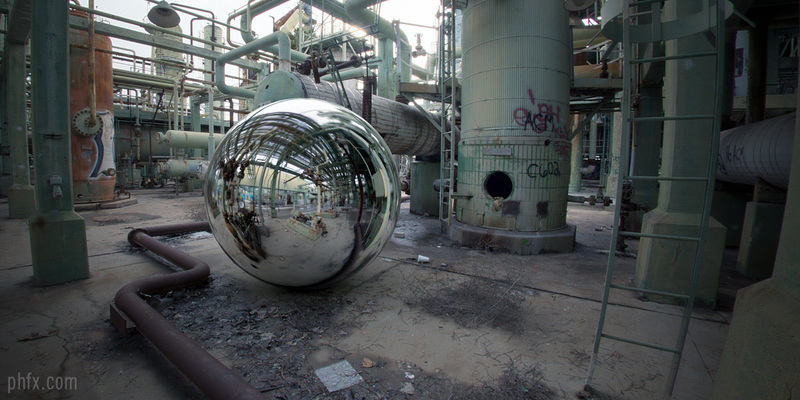 When it comes time to shoot the HDRI, often right after a take, the majority of users fire off the HDR rig at the device and "follow" it as it shoots. Once finished, grab the rig and shooting can resume quickly. The goal is not to be obtrusive towards the shooting schedule. The general workflow for the user/operator is to capture, review, edit, backup, and sync back with the studio. Final HDR images can be constructed on or off set in case preViz or the VFX Supervisor would like to see the final HDRI. Panorganizer provides a quick and efficient workflow allowing the HDRI Operator to focus at the task at hand and perform other duties while on set without being burdened by a large rig or time consuming workload. Syncing HDRI libraries over the course of shooting helps the studio get going earlier on work and keeps the line of communication flowing. The following is recommended hardware and what has been successfully used in the past. Each HDRI Operator should get their own unique laptop. Panorganizer runs on Windows XP, Windows Vista, and Windows 7. It is strongly recommended for each laptop that 2x 1TB drives are purchased for on location backups for double redunancy. For those "baking" large quantities of high resolution HDRIs or those setting up a main processing system at the studio it is recommended to use a 64bit OS, quadcore, with a minimum 8GB RAM. Phil usually sets up each laptop or provides a solution for the studio to install on their own. 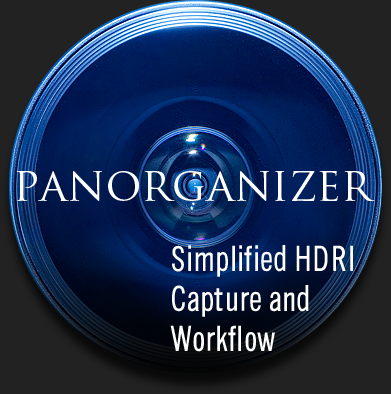 The general concept behind Panorganizer is to simplify the task of HDR source image acquisition at a higher speed and lower cost than more expensive systems without sacrificing image quality. 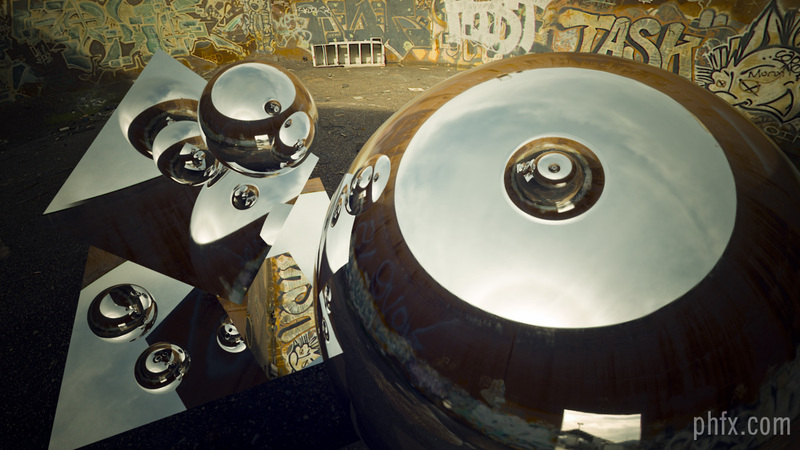 As live action VFX shot counts increased the idea was born for a more reliable, faster, efficient, and automated capture system for the growing number of spherical HDRIs. The system was designed to adapt to the higher volume of current and future productions where you may be capturing several thousand HDR images. It was developed by an individual performing this work on high profile feature film sets and was created with the mindset of a realistic and practical workflow for interacting with VFX studios while being on location. After being used for several years on productions, Panorganizer and it's modular rigging concept has proven itself in a large variety of weather conditions all over the world. The shooting logic behind this system can be used to capture extremely low light conditions to extremely bright outdoor sunny day scenerios and still produce high quality output while photographing acurate light intensities. The software is simple and adaptable. The hardware is modular and compact. The the setup time and capture speed is fast. The HDRI data organization system has been well accepted and used on feature films across the globe. Here's a rundown of what Panorganizer is all about. Phil prefers to train the HDRI Operators in person whenever possible. In the past he has had to train individuals via video conference or email. 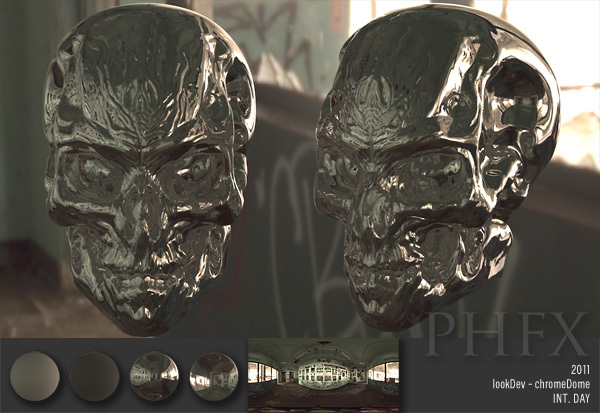 When working on high profile projects he doesn't want to leave anything to "chance" when it comes to acquiring HDRIs. This material is extremely important and used by many others further down the line. Phil also provides his immediate contact information to each operator in case there is a true emergency on set.